Today I will be writing about a project that although I have known for a while keeps coming back to my head every time I try to think about a successful example of going beyond sectors (housing, energy, transport…) when doing slum upgrading interventions. I learned about this project when I was in India working on my PhD and evaluating the Slum Rehabilitation Scheme being implemented in Mumbai. I was volunteering at the Slum Rehabilitation Society – a small but inspiring NGO that worked in slums since the early 70’s – and since they were helping me out with some of my research I felt the need to help them out with one or two basic things. In return for their solidarity I agreed to help them (1) redeveloping their webpage that was quite outdated – I have to admit that I am not especially proud of my work on this area since my design skills stopped in kindergarten – and (2) help them develop a set of community workshops for a Safe Electrification and Loss Reduction Project in Mumbai that was bound to replicate the SELR project in Sao Paulo, Brazil. The NGO in which I was volunteering was in charge of communicating the project to slum households on behalf of USAID and COPPER International, the two agencies leading the projects. I left Mumbai long before the community workshops started so my knowledge of SELR Mumbai or its outcomes stopped there but during the workshops’ preparation I learned a little about SELR Sao Paulo and that is what I wanted to share with you today. The Slum Electrification and Loss Reduction Project –SELR- aimed to (1) solve a large-scale and long-term problem of electricity losses from theft and non-payment in slums (2) while bringing more reliable and safer electricity service to its residents and (3) reduce their electricity consumption dramatically to affordable levels. Its first pilot was in Paraisópolis, a slum in Sao Paulo. At first, when I started reading the papers that documented this pilot I was a little skeptical. Of course, electrical companies will always be happy to ‘legalize’ electricity consumption in slums – if local governments allow them to – since it means a considerable reduction of their losses due to theft. However, from what I had seen before, this type of projects needed to be accompanied by large tariff subsidies since poor slum households, who were not used to pay for electricity and generally had the most inefficient electric appliances, could easily pass from theft to non-payment once their electricity became legal. So how was the SELR project in Sao Paulo different? Two elements in my perspective were fundamental for its initial success (I haven’t so far found long term impacts evaluation of the project therefore its sustainability remains a research question to address). The first was the inclusion of an energy efficient component in the project. 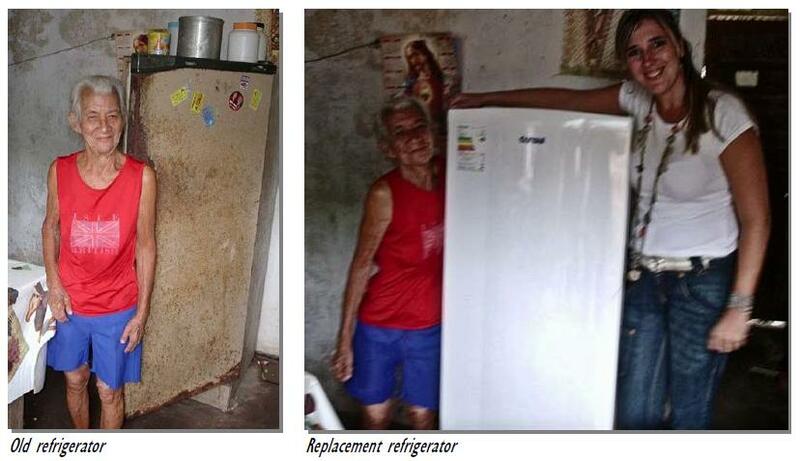 All households involved in the project received new efficient lights and the poorest of the households that had inefficient refrigerators received replacements. This allowed households to reduce their total electricity consumption to a more affordable range. The other element that was fundamental for SELR’s success was the inclusion of a three month education campaign on electricity payment. To reduce the impact of passing from electricity consumers to costumers bills were capped at 150 kWh for a period of 3 months. During this period of time households received their electricity bills containing the real information about their monthly consumption – which allowed them to adjust their behavior – but only had to pay for 150 kWh. The next table shows the results in reduction of electricity consumption pre and post regularization and due to the energy efficiency component. 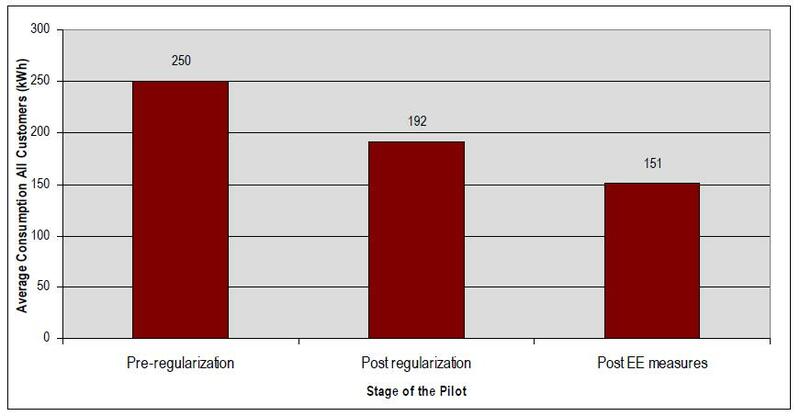 Overall the regularization and Energy efficiency measures leaded to a reduction in 40% of the initial electricity consumption. – Improved security and safety: emergency incidences related to electricity passed from 57 in the first 6 months in 2006 to 2 in the same period in 2007.